The Planets Sing for German Entry. The Norwegian/British astrologer Andrew Bevan has moved Germany up to first position in his recent evaluation of the candidates to win the Eurovision Song Contest 2010. 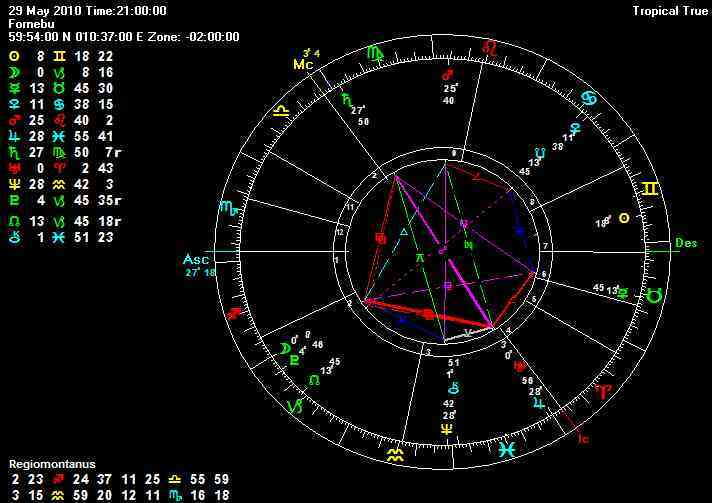 It is the birth chart of the German contestant Lena Meyer-Landrut that has convinced him and caused him to change his mind. In his previous analysis of 18. March 2010 the constellations caused him to pronounce Armenia & Sweden as celestial favorites. Germany are entering this year with the song "Satellite' sung by 19 year old Meyer-Landrut. They last won in 1982 with 'A bisschen Frieden' sung by Nicole. Link to the full astrological discussion at Skyscript. Chart for the Final, Telenor Arena, Oslo. Every chart has its secrets. One thing that had to be considered was whether the planet Saturn could be the significator and representative of a little satellite orbiting planet Earth. "This could offer a new perspective," says Bevan. "Saturn does not have to run rings round the Moon to represent a small communication unit on a long distance journey on the outskirts of our boundaries. The symbolism is good at the same time as this invites the Mars and Aries to act as signifcators of Germany. 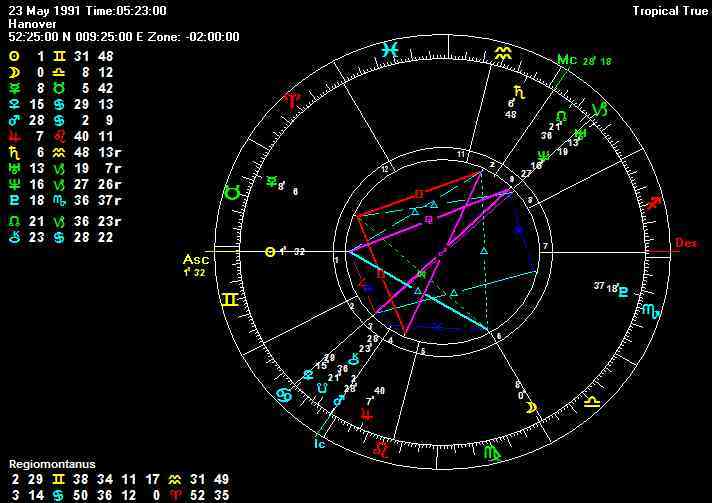 The persuading factor is the birth chart of German Lena Meyer-Landrut, as far as the astrologer is concerned. Her chart is beautifully tuned to the moment the final starts in Oslo on 29. May at 21.00 hrs CST, less than one week after she celebrates her 19th birthday. "This going to be a very exciting evening for her. A chart cast for Sunrise on the day she was born shows how the Sun and Moon pick up on the angles in Oslo. She is also born under a relatively rare constellation between Jupiter and Saturn that also is prominent during the Eurovision Song Contest final," says the Astrologer. Lena Meyer-Landrut has an exciting chart when compared with the planetary configurations for when the Eurovision final starts in Telenor Arena. Her Sun and Moon are beneficially located and she is also born during a rare configuration between the planets Jupiter and Saturn that reoccurs at the same time as the final event. The planet Mars is strongly positioned in Leo on the evening of 29. May. This agrees with the Sun sign of the Israeli artist Haral Skaat. His song 'Miril' or 'Words' is built upon a dialogue with God. The song is among the favorites, although the poetry of the song might represent a challenge to the average Eurovision viewer. Safura Alizadeh will be representing Azerbaijan with the entry 'Drip, drop'. 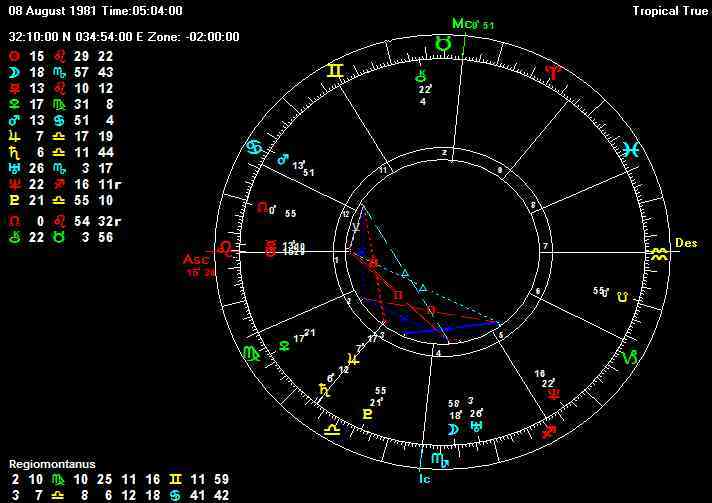 Transit Saturn is aligned with her natal Sun at the time of the Eurovision final. Bookmakers presently hold her among the favorites. 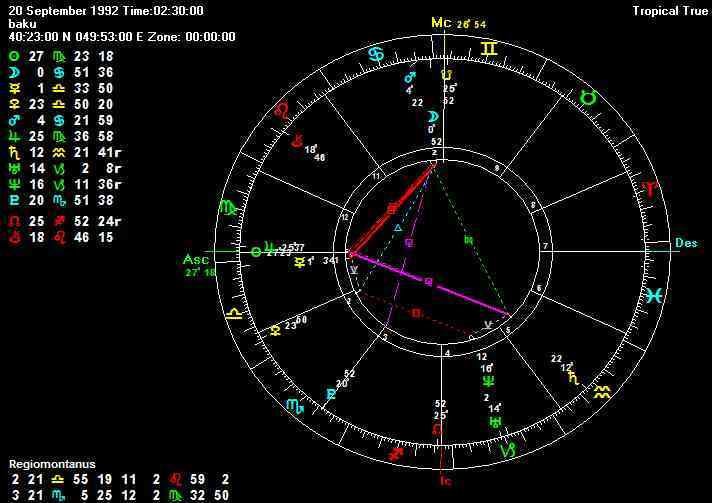 View the astrologer's chart for Eurovision 2009 here. Astronor - 18. March 2010 ; "Armenia & Sweden - Celestial favorites"
NRK - 22. February 2009 ; "Stars Predicts Success"
Hegnar Online - 15. mai 2009 ; "Astrologer believes Norwegian victory in Moscow"
Hegnar Online - 17. mai 2009 ; "Rybak and Norway wins Eurovision"